Waste is defined as any household items that aren't organic or can't be recycled. 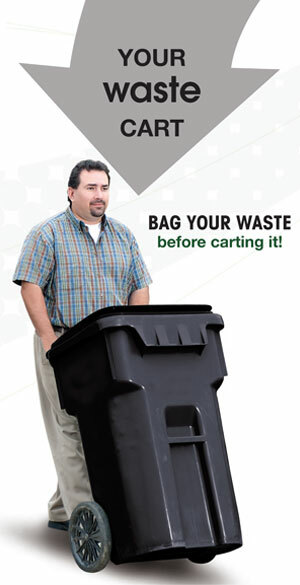 All waste must be put in a bag and placed in your black waste cart. Your cart will not be collected or emptied if there is loose waste. Items like glass that can't currently be recycled are considered to be waste and should go in your waste cart. 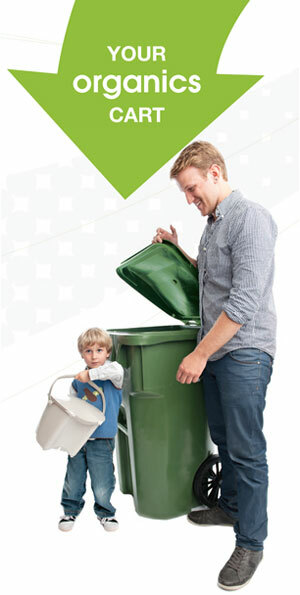 Use your waste cart for all sanitary products, wipes and diapers. Flush smarter. Sort it. Don't clog it! Glass drinking containers (pop, juice, beer bottles) can be returned to the Leduc Bottle Depot for a refund. 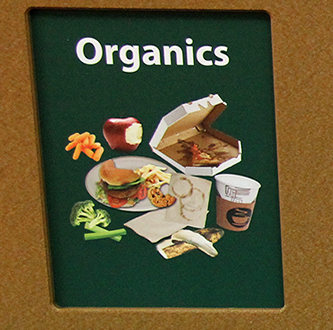 Organics – all food and yard waste, and many items made from natural materials. Preparing your green organics cart for pickup is easy and will ensure all material can be emptied on collection day. Line the cart with 100% compostable bags, paper towels or newspaper so material doesn’t stick to the bottom. Alternate layers of ‘brown’ material (leaves, shredded paper, cardboard, sawdust) and ‘green’ material (meat, dairy, garden waste). Store your organics cart out of the direct sun in a cool, well-ventilated area year-round. Put your cart out for collection on scheduled collection days even if it is not full. Sprinkle the rim of your cart with a small amount of baking soda, vinegar, salt or garden lime. Place a briquette in the bottom of your cart. Keep food scraps frozen until your scheduled collection day. Rinse the cart weekly or every second week with a water/vinegar mix or a diluted bleach solution.